Confessions, Resolutions, and Applications- 2014 Begins!!! Tonight whilst the boys were watching some TV after our pizza and movie party I cruised Pinterest. Love Pinterest.All sorts of ideas and things to try. But part of the show caught my attention. It was a comedy about a little girl who loved to dance but was absolutely horrible. Her dad encouraged her to dance if she loved to dance and not worry about how good or bad she was. I totally related. In fact the "Good Ship Lollipop" started to hum its' way through my mind at once because it was the song I practiced tap dancing to when I was 6 or so and really really wanted to be a dancer. It was from a community ed class and all I remember was shuffle kicking my heart out- but never at the same time as anyone else. I have a memory of always going left when the rest of the class went right and not knowing how to change it. And as I talked to my husband after the tv show wrapped up, a host of other like experiences went through my mind. The Summer ed acting class where I thought I'd shine and instead learned I couldn't act. The drums audition for band where I was kindly told you had to have some sense of rhythm to play percussion. The grade school musicals that I sang my heart out for- but always at the wrong key.Then there was the high school cheer-leading tryouts that I went to because when I was 4 or 5 there was nothing I wanted more to be then a Dallas Cowboy's cheerleader. I told my husband tonight, there was the A squad, the B squad, and then the wrestling cheerleaders. You can guess what team I made-it was the only one where the cheerleaders sat still while they cheered. Always my lack of coordination, inability to tell left from right, and lack of rhythm came up as a block. And honestly, I'm glad today. Because as an adult I can look back and realize that I can't tell left from right because I'm ambidextrous in some areas. I draw better left handed although I'm actually right handed. I really don't have a sense of rhythm but that doesn't stop me from totally loving my Zumba classes- and there is no one better then me at singing and dancing in their pj's when my favorite song comes on. Even so, with all these memories of things I tried growing up, only to realize they weren't "my thing" I started to think of all the people out there making resolutions tonight. Resolutions to eat better, live better, be better. And I think I'm going to resolve to pretty much stay who I am. Because finally after 39 years I found out what I really love to do and what I really do well. Because although I couldn't make a basket if my life depended on it, although I'm master of the "spontaneous solo's" at Zumba, and although my singing is still off key, I love so much about who I am right now. I love that I have an amazing family, a job/ministry I love and believe in, a host of sweet and supportive friends, and a list a mile long of things I can't wait to learn and try. I love that God made me an artist and gave me a way of seeing the world that is pure art. I love that I can take paper and paint and fabric and glue and make something absolutely unique that glorifies God with it's creation. I love that I get to introduce other people to their own creativity and encourage and empower them to use it. Life is pretty good. There are hard things, I have a couple of deadlines right after the holidays that have had me working over the holidays, and there's always the seasonal depression looming at this time of year, but even those a bright side. I had to work, but oh my gosh am I glad that I get to do what I love, with people I love, for people I love. The seasonal "blues" are there but they make me pay closer attention to how I feel and they make me force myself to get involved with projects and people to stay engaged. So tonight, think a little about the you that you are and not the you that you wish you were. It's ok to want to live better, eat better, be better but make sure it's a better You that you're resolving to be and not a better someone else. Does that make sense? Appreciate who you are, do all the things you love whether you're any good at them or not, be excited about the amazing gifts and abilities you were given and be passionate about the things God's given you a passion for. Resolve to be a "you-er" you to quote Dr. Seuss, because there's no one else just like you. But I'm also going to resolve not to resolve. But to be open to what God might have planned for me. Life never goes exactly the way I think it will anyways, and if I leave it up to God it's usually much better then I could have "resolved" to have it. But I'm all for dreaming because I think that in the dreams, God's preparing you for what He might have planned. So tonight- don't resolve. appreciate you. Let God lead- but go ahead and dream. Dream Big. 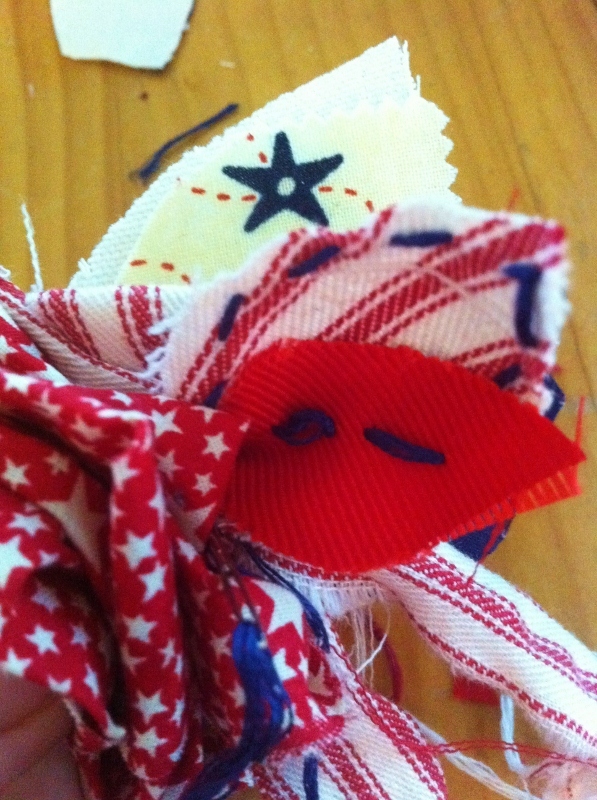 Fourth of July Corsage Tutorial With a Sneak Peek!!! I wrote this post 2 years ago but still LOVE this tutorial so if you haven't seen it- check it out and at the end I put a sneak preview of the corsage I'll have a tutorial for in the next Somerset Seasons and Holidays out in September!!! Happy Fourth of July!!! 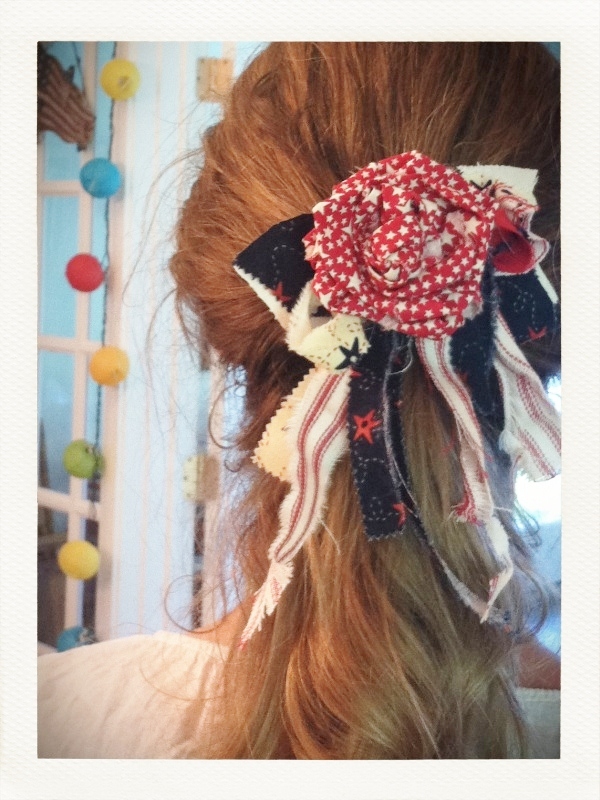 To celebrate today's holiday I whipped up this sweet little holiday corsage yesterday. It's red, white and blue at it's best. With a little imagination and fabric you can easily adapt this tutorial to any holiday or special occasion. I think this would be a lovely finishing touch to your outfit when worn to a wedding or garden party. The design is meant to be reminiscent of the ol' time corsages worn high on the shoulder but because of the versatile pin back/clip combo it can also be worn as a hair accessory or you can clip it to a long necklace for a focal accent. However you choose to wear it- Enjoy! Step One: Rip or cut a strip of fabric approx. 2' in length by 2 1/2" in width. 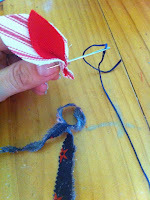 Step Three: Thread your needle and pierce your knot in the center then begin to wrap the strip around the center knot, adding a stitch here or there as you go to hold the shape. 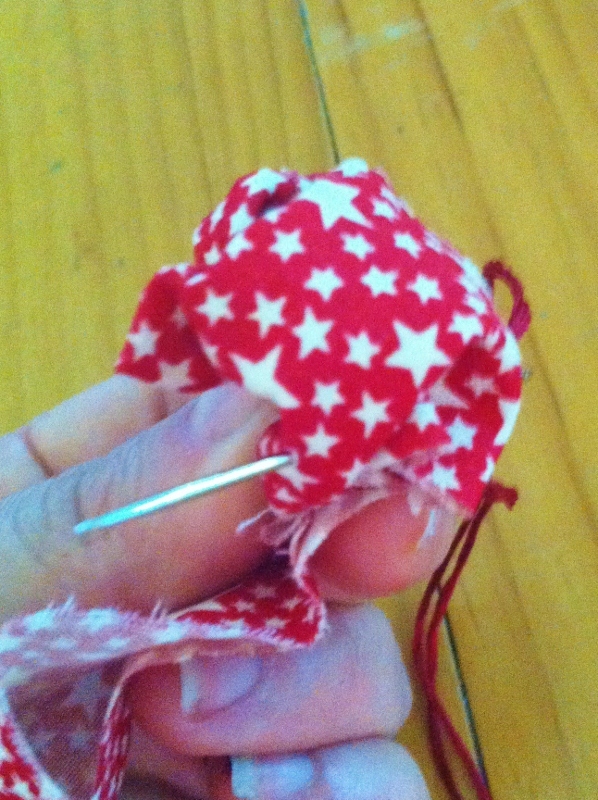 Step Four: Give the fabric a twist here or there before adding a stitch to create the form and appearance of petals. 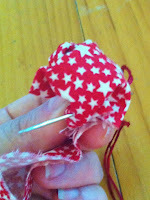 Step Five: When finished, add a few more stitches to the base of the flower to secure. Then add a couple of stitches up and through the center. Knot off at back and cut thread. Step Six: Choose a couple of coordinating fabric and cut 2-3 leaf shapes. Place on canvas and leaving a 1/4" border cut around your patterned fabric. Rip a few more strips to hang down decoratively from corsage as well. 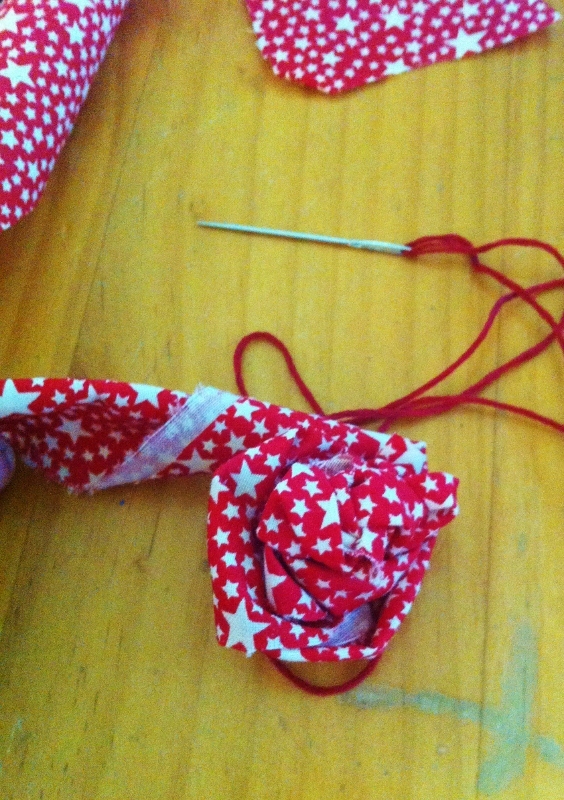 Step Seven: Play around with your positioning and then stitch leaves to back of fabric flower as desired. 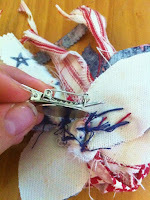 Feel free to embellish your leaves by stitching around their edge or adding some buttons or beads. 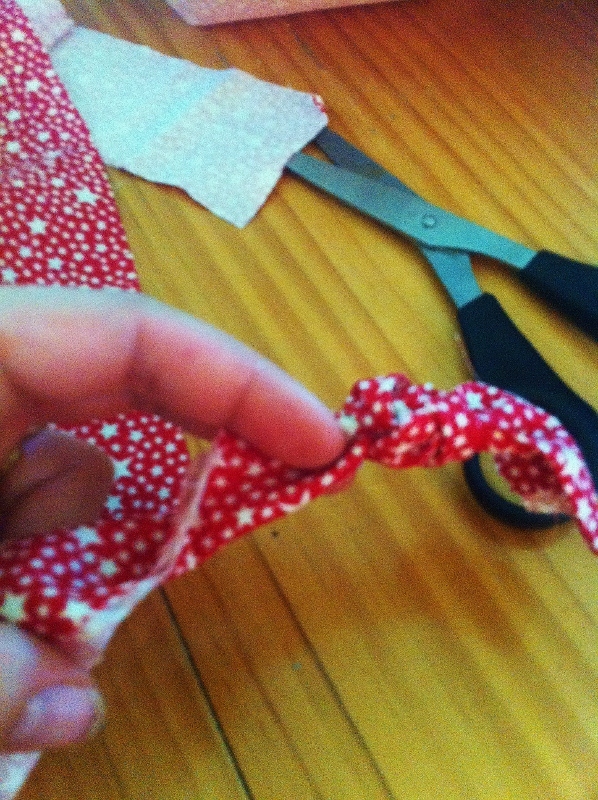 To add dimension to the leaf, pinch bottom and stitch to hold as shown. Step Eight: When you've finished assembling your corsage and stitching it all securely in place heat up your glue gun and adhere pin back to back of flower. Hold for a few seconds for better bond. 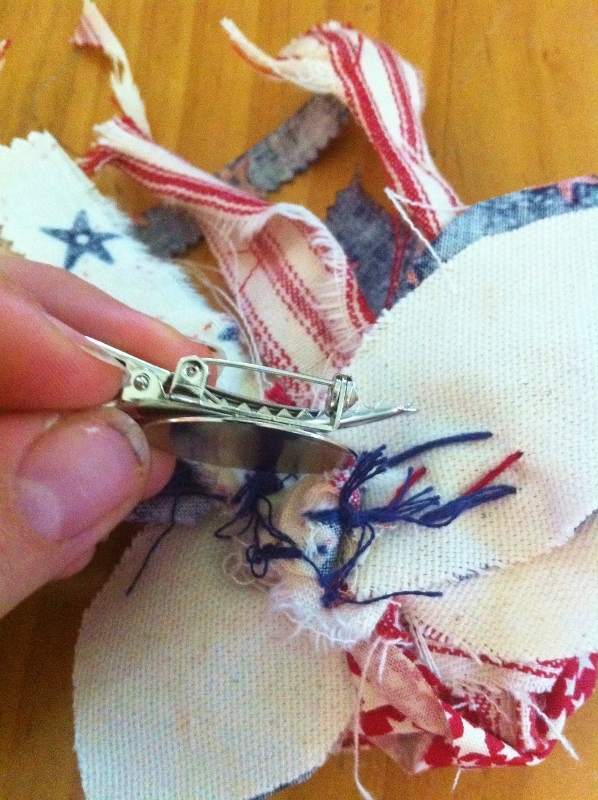 Alternatively, you could stitch on a pin back. Make sure to position slightly high on back of corsage so it hangs well. (and 'cause you know you look good). Best Wishes to you and your family- I hope you have a fabulous Fourth of July!! And here's your Sneak Peek.Enjoy!!!! Hello All! I've been away for a while again and have been waiting for the right time to post again. This morning I woke up and really felt like it was time. A year ago that would have meant booting up the laptop, downloading my photos, and grabbing a cup of coffee. This morning, on a whim, I decided to see what I could do with my ipad and wireless keyboard and so within seconds of downloading the blogger app for ios onto the ipad I was up and running on this post. I LOVE THAT! Why I am supposed to post this morning? I'm not sure but I do have a ton of stuff to share with you. It's been a while! First, Obsession Number one! I am now on my sixth piece of Alabama Chanin inspired hand embellished clothing. I started drooling over designer Natalie Chanin's work back when her first book came out. But it wasn't until her latest, Alabama Studio Sewing and Design came out, and my Mother-In-Law became interested as well, that I actually attempted any of her work. My MIL did all the hard set up work that comes with any new project. She figured out how to cut the stencils, how to paint the fabric in your kitchen, what paints and brushes work best, and even adjusted a couple of the patterns. THEN, she walked me through some basic dressmaking skills. For instance, the arrow that's on a pattern piece IS important! I thought it was just a hint as to which direction to place the pattern piece on the fabric. My MIL showed me how to use it to measure against the edge of the fabric to ensure the grain of the fabric is perfectly lined up so that the dress hangs nice. I started this dress last July and finished it right before Christmas. I also made a couple of bolero's, a skirt, a couple of shirts, and am working on a long skirt now. It's perfect for picking up and setting down whenever I have a little bit of time. Next, Obsession Number two! I admit I have fallen hard for Annie Sloan's line of Chalk Paints. This one was my own mother's fault. She took a craftsy class last fall about upcycling furniture and started encouraging me to try painting some pieces with her. I had heard so much about Annie's paints that it wasn't too hard to convince me to give them a try- one thrift store chair later and I was hooked. It's another down time sort of activity. And it's quick. A small table or chair takes just a few hours. The colors are beautiful and the finish is gorgeous and I'd highly recommend you give them a try. I'll tell you more about that later. The other extra time user up for me has been my volunteer work for the arts ministry, Art 2 Heart. I'm on the leadership team and it has been such a gift from God to pair me with this group of women. I'm part of a team there and love the companionship and sense of purpose we all share. Being an artist is lonely business sometimes and if you're somewhat introverted like I am, with a light deprivation sensitivity it's easy to crawl into a shell in October only to emerge in April or May. This year I struggled, it was so so grey and spring took so so long here in MN. BUT being involved with my sisters at Art 2 Heart, bible study, and my family all really kept me from completely cocooning. I think the biggest reason I took a break from blogging wasn't that I was occupied elsewhere, or struggling with my moods, or had new hobbies, or new relationships to explore, but because my life has really changed and I wanted to have the opportunity to step back and see what was really important to me. Who I have become. Who God has led me to become, in the last couple of years. When I first began this journey I was a frustrated new mom struggling to find myself in that new role. 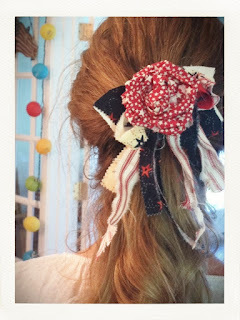 Then I was a scrapbooker, a knitter, and then a wire and fabric fanatic. I was taking chances in a big way for the first time in my life, I had my first magazine submissions, my first magazine publications, my first audacious thought about writing a book, and then a couple of years after, my first book was published. I thought that was the end all be all but realized that it wasn't. There was more but I needed to discover what that was. What comes next? The world says make a big deal of your self, promote yourself, market yourself, at the expense of privacy. And it didn't feel right. I really believe that it's God and the Holy Spirit working in me that has led me here. So how to give Him the glory? So I've stepped back from it all, done some searching, some reading, some writing, kept up with my magazine submissions, and my volunteer work but not much else. Now, months later I really feel like I'm on much firmer ground. with; it's not my favorite kind of post. I like teaching and inspiring and sharing, but sometimes, I just want you to know what's going on. What's real and authentic. So will I continue with the blogging? I think so- especially now that it works into my day a little more conveniently then it did before. And especially now that I feel I have a voice again that's authentically me. It's just taken me a little while. Thanks for your patience!!!! UPDATE: 9:23pm So the oh so convenient ipad/google+ way of blogging that I thought was going to work so well ended up with my deleting several hundred photos. Some of which were on this blog so please bear with me the next couple of days while I update.